Before you decide which treatment for warts will work for you, you need to understand what causes warts. Then, you can understand how to treat them. According to Wikipedia, wart or verruci may be found on the foot. This is called a plantar wart. The skin surface is usually a small, rough tumor, typically on hands and feet. The skin may appear blistered or appear cauliflower shaped. This a common condition created by a viral infection. Ten different varieties of warts have been documented. Dome shaped warts are usually found on the back of your finger, toes and knees. 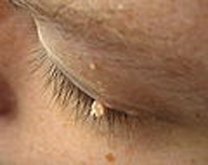 Flat warts can appear on the face, legs and other parts of the body. Or, they may appear under the fingernail. The degree of infection is affected by your level of health and the strength of your immune system. By supporting your body with proper diet, plenty of water and quality rest, your body may be able to stamp out the infection. However, when self treatment through diet and rest do not help, there are some natural alternatives available. Good hygiene reduces the incidence of skin warts. Use caution and do not touch, or pick at a wart - yours or someone else's. Practice caution in community areas and wear protective foot gear. In your home, make certain the bathroom is sanitized to prevent spread of the virus. If you have warts, do not share your towel with anyone and use it only once. Remember warts are a virus and are contagious. One of the benefits of iodine, is its extensive use to control viruses and bacteria. The medical field has been quietly using iodine for years in and out of the operating room. A popular product is tincture of iodine which can be used topically. Janice from Red Hook, NY wrote she had been bothered with warts when she was a teenager. She started her treatment for warts with a drop of iodine on the warts every day. After three months, they turned black and fell off. Joan Marie from Shenandoah Valley, Virginia, wrote she painted iodine on her skin tag and wart. They dried up and fell off. She applied treatment two or more times a day for a month. She noted that the surrounding skin area was tender and mentioned to be careful to coat just the tag or wart. Marie from South Bend, wrote she had a filiform wart on her face right below her lip. She began applying Lugol's Iodine solution (iodine/iodide) to the area. Within a week, a large portion of the wart fell off. She wrote that it took about four weeks for the whole thing to disappear. One individual wrote that because he is an athlete, he had an uphill battle with warts. He tried everything for the treatment of warts from freezings, burnings, creams, surgery, etc. But nothing worked. The warts either returned, or spread. Then, he tried Apple Cider Vinegar. He used a cotton swab tip to coat the area and then placed a bandage over it. In three weeks, the warts were gone. He wrote that at first the outer edges turned white. Then,the inner area turned black. He said it hurt like hell at night. The area itched like crazy and was a bit of a pain to change bandages. But, he reasoned this was nothing compared to a lot of diseases. His final comment was that he thanked God for apple cider vinegar. He said it worked perfectly. If you suffer from another skin condition called psoriasis you can learn how to treat this at home.